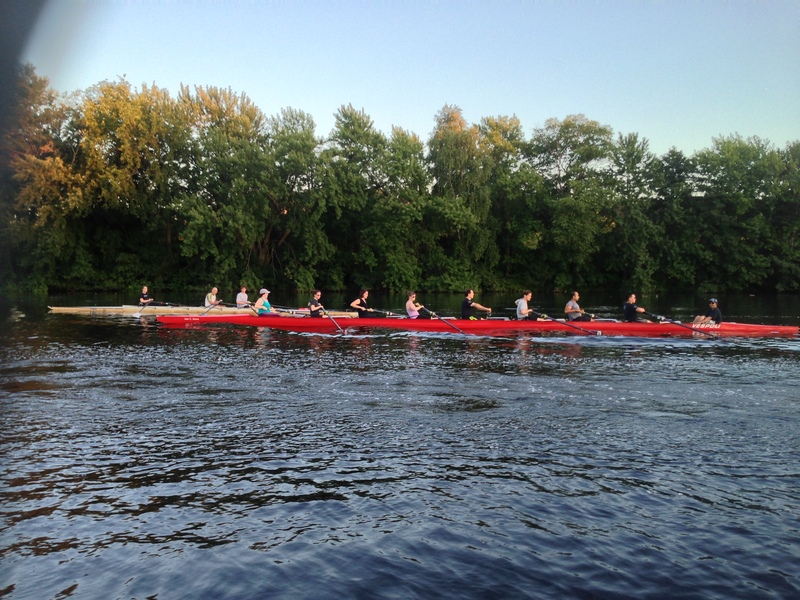 Renegade Rowing Practice earlier this week. As we begin training for the fall season it’s important to work in some longer pieces to build up our endurance and prepare ourselves for head races. Head Races are anywhere from 4k – 6k in distance and take around 15 minutes or more to complete. They are run like time trials with one boat starting at a time. Mental toughness is key to keep intensity up and push hard enough to catch the boat in front of you. In today’s Rowing WOD you’ll need mental toughness to keep pushing through the middle rounds. Imagine there’s a crew just ahead of you. Chasing them down is the only option. Pick one split you can hold all the way through each piece. If possible try to negative split each round. On the push ups get full range of motion and scale as necessary. You can scale by elevating your hands, giving yourself a target, or decreasing the volume to 15 or 10 per round. If you’re looking to spice things up and have some more fun try this on the water. I did this workout in a single off of the docks at Community Rowing this Wednesday. It was pretty epic. Can’t wait to have a group of Renegades doing workouts like this on the water with me. If you’re interested let me know! Post time and splits to comments! This entry was posted in Fitness, Rowing, Strength and tagged endurance sports, exercise, functional movements, mental toughness, new sport, rowing, sports, training, water by Renegade Rowing. Bookmark the permalink. Average split was 143.6. Round 4 bumped that right up to 1.48, so had to work hard on next two rounds to bring it back down. Pressups were always a welcome break. First full session. I was not a fan of you Pat when I finished. I decided to start following these wods since I just scored a model D on Craigslist. I thought this one would be easy, but it was tough (especially with a hangover)! 20 PU x 5 <— I never made it to the last set, but I did finish the rowing. U will love them but u will hate coach Pat. He’s evil. Following Coach Pat will make you a better rower. These WODs will give you a sub seven 2km. There intense workouts and if your willing to push yourself you will see results on the monitor. Thanks Ryan! Love the feedback! Awesome work from everyone! Great comments and thoughts from all. It sounds like I’m doing my job. I’m glad you don’t like me sometimes because that means I’ve pushed you. It also means you’ve pushed yourselves harder than you thought possible. Thanks for the great feedback and keep it coming. I’ll throw in some truly fun stuff every now and then, but keep hitting everything hard and you’ll get to where you want to go.